Everyone in Maine, including Maine Preservation, recognizes the need to seriously address the traffic backup every summer in Wiscasset. For anyone passing over the Davey Bridge to Edgecomb, congestion and delays are common during the summer months and sometimes beyond. The Maine Department of Transportation (MDOT) has proposed various options for traffic improvements over the past several decades. In March 2016 the most recent plan for a bypass of downtown was shelved and three new design concepts were introduced. DOT's preferred choice, Option 2, adds two sets of traffic lights and eliminates all on-street storefront parking along Route 1 throughout downtown between Middle and Water Streets. Historic sidewalks would be eliminated and replaced with new widened walkways, diagonal storefront parking would disappear and visitors and shoppers would be directed to a block away on Water Street, where MDOT proposes to turn an occupied property into a parking lot. - In Public meetings and communications in spring 2016 MDOT stated the project would require no taking of private property and that 80% of anticipated project costs would be covered with federal dollars. Now MDOT states they will not be using federal funds, avoiding federally mandated environmental and historic review processes. Plus, additional funds have been spent condemning and acquiring a building. Consequently, MDOT will increase costs to residents and are unnecessarily using all Maine taxpayer dollars. - While MDOT said 20 additional parking spaces would be created along Creamery Wharf, now the historic Hagget’s garage building, housing a thriving office, will be demolished to make way for parking. 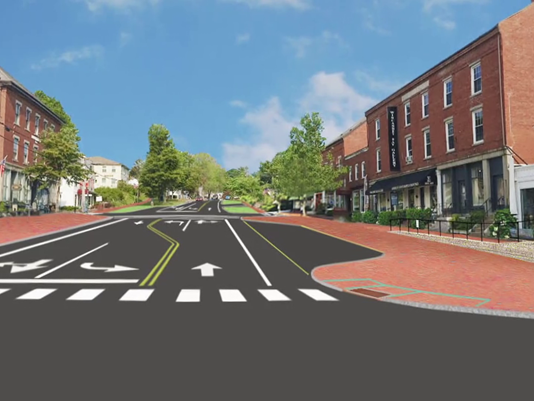 - The maintenance of many design elements of the project, such as the additional traffic lights, expanded sidewalks and parking lots, will likely be costs assumed by the town in the future, raising the question of whether or not local tax increases will be necessary. The proposal to remove all parking along Route 1 on Main Street will have a devastating impact on the viability of businesses in this vibrant commercial district. Maine DOT appears to be alone in believing that parking causes the traffic problem in Wiscasset. Yet, numerous studies in communities across the nation have proven that parking not located directly within downtown areas has a major negative impact on businesses. In fact, MDOT’s own architectural survey report of downtown Wiscasset maintains that on-street parking is an integral part of the Village’s historic setting. In communities the size of Wiscasset, each downtown parking space is worth approximately $25,000 a year in local sales dollars. Locating these spaces off Main Street is not equal to providing shoppers with visible and accessible parking adjacent to businesses. The current option proposes the demolition of the former Coastal Enterprises, Inc. headquarters on Water Street, Hagget’s garage. This 1918 building now houses the Midcoast Conservancy with 9 employees. The Conservancy had made entered into an option to purchase the building from CEI, but Maine DOT made the “urgent” decision to exercise eminent domain, taking the building and directing the Conservancy to relocate. They would have to move outside Wiscasset, as comparable space is not available. Not only does the building house its headquarters, it is providing the community with an art gallery, meeting space and acts as the hub for the Conservancy’s program that provides skiing equipment for children. The loss of this anchor and the district’s loss of employees and building users who frequently shop and eat downtown for a small parking lot are short-sighted and will have a negative and long lasting economic impact. Traffic through Wiscasset, especially in July and August, is an issue that has been perplexing Midcoast Maine for years. However, prior to spending $5 million of Maine taxpayer money on an unproven “solution” DOT should test their plans. The installation of temporary traffic lights and separately testing temporarily blocking off of parking spaces is an easy and affordable step in discerning the true viability and economic impact of this plan. In 1997 an MDOT study projecting traffic through 2015 found that there would be zero percent reduction in delays from changes made to downtown. Now, MDOT is claiming its current project will reduce traffic delays by over 50%. It is irresponsible and unwise to spend so much time and Maine taxpayer’s valuable money on a project with no assured positive outcome, especially if it is against the will of the community and comes at the cost of locally owned businesses and the vibrancy of one of the state’s oldest and most revered historic communities.